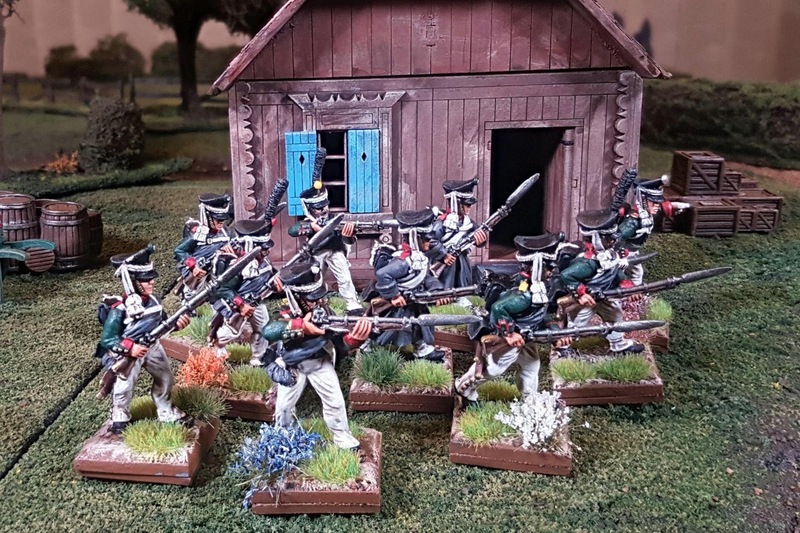 As well as the 6mm Napoleonics I've also been working on 28mm Napoleonics. These are for use with Songs of Drums and Shakos. 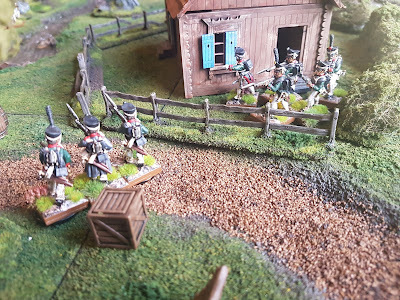 I played a game using my French against Ed's British riflemen a few weeks ago and since then have been playing Blücher a lot. In the mean time I have managed to get my Russians painted. The Russians are all metals from Front Rank and are a mixture of musketeers, grenadiers, jeagers and carabiniers. 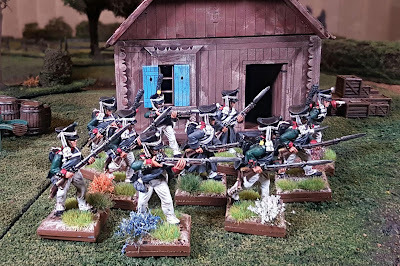 They're in the late war, 1812 onwards, kiwer shako. 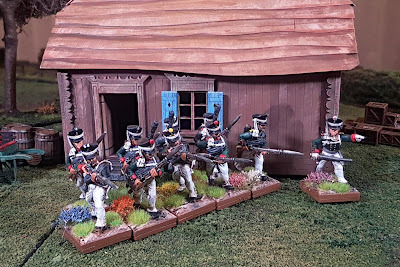 For size and proportion they fit in just fine with the plastic Perry French infantry. 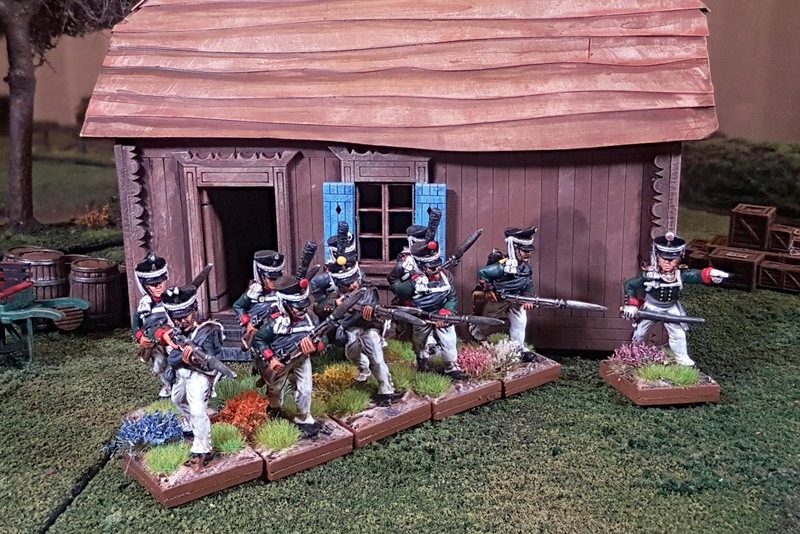 In the photos there is also a Russian building from Charlie Foxtrot Models. This is lovely MDF building, though lacking in internal detail, which I will be adding. I also have one of their Spanish buildings to finish off and use when next playing Ed at SDS. I played two games with my son Brendan today. I won the first and he won the second. 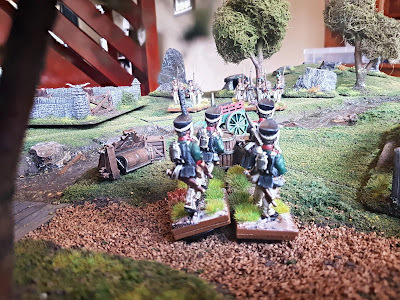 The key to victory seemed to be getting volley fire groups together, though my carabinier with his rifle (as SDS rules have them have) did manage to get some good kills, I will have to paint up more of those. We had a great time as usual, quite a change of pace from the Blücher games. So, back tomorrow with another Blücher against Ed and Monday with a game of SDS against Gerald at COGS. Someone is attacking the house! Get out there and defend! Some French formations in the distance.